Posted on February 18, 2015 by Hawaii's Local Buzz. Every aspect of how coffee is handled, from the soil in which it is grown to the way it is ground, affects the flavor that ends up in your cup. We take care of our Hawaiian Ka’u coffee beans until they reach your doorstep — then it’s up to you to grind them and create the perfect brew. Burr grinders are considered the best option for grinding coffee because they create an even grind, which results in a consistent flavor that captures the nuances of your beans. This reasonably priced grinder not only creates a consistent grind, but also makes the grinding process convenient. You can store all of your beans in the top compartment, and grind them as you need them. There are more than 40 different settings, enabling you to find the perfect fine grind for espresso, all of the way up to a coarse grind for the best French Press coffee. 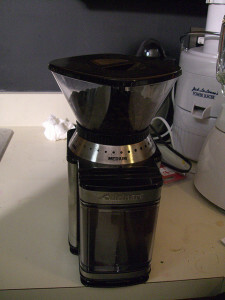 Another reasonably priced grinder, this one features 16 grind settings as well as a pulse option. It’s a slow-grind model, which means that your beans don’t heat up as you grind them, and no flavor is vaporized. If you’re often on-the-go, this small burr coffee grinder will enable you to enjoy freshly ground coffee anywhere. It’s a hand-crank model, which allows you to feel more connected to the coffee-making process. It creates an even grind and is made from ceramic so it doesn’t rust. Explore our selection of Hawaiian Ka’u coffee at Hawaii’s Local Buzz and discover exceptional, high-quality beans to use in your new burr grinder.